Unsurprisingly, visiting Hakodate’s Morning Market in the middle of the afternoon yields mitigated results. At three, the stalls are closing, the markets getting empty. Disappointed, I get on a tramway towards Mt. 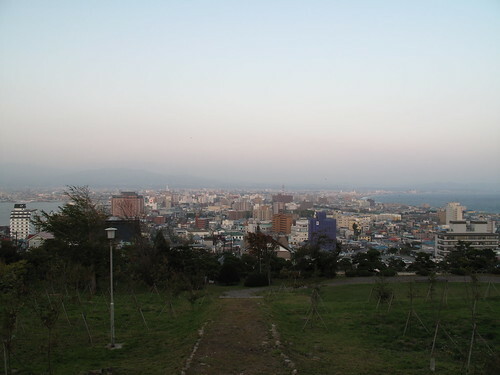 Hakodate which I end up climbing a few hundred meters on foot, since the rope-way is out of order. I just want a better viewpoint on the city — blame my Swiss blood — and indeed, the elongated urban area squeezed between two branches of sea is a beautiful sight. 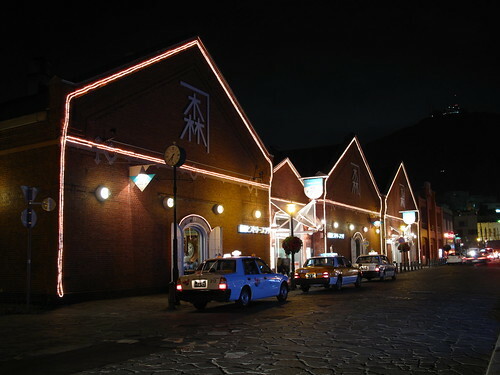 In fact, Hakodate is one of the first Japanese cities to surprise me with the elegance of its urbanism: some eye-pleasing streets leading to the mountain, a couple of old buildings with a strong influence of foreign architecture, and a series of successfully docks reconverted in market halls and restaurants, brightly illuminated in the darkening evening. 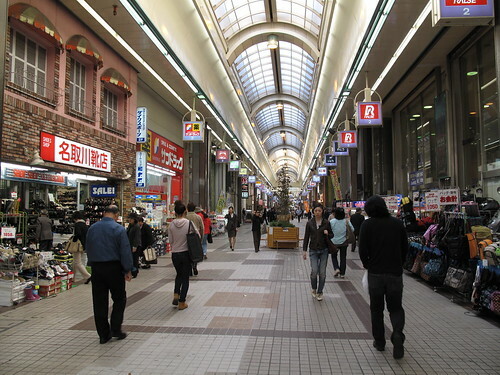 It is noteworthy because I often find Japanese cities lacking a coherent, aesthetic architecture. Of course, there are remains of old eras, typically the traditional wooden houses in the Gion neighborhood in Kyoto, the exuberant consumerist arcologies of modern shopping malls such as Roppongi Hills, or the futuristic neon-lit fantasies of Dotombori in Osaka, or Shibuya and Shinjuku in Tokyo. But the average city center, in between those extremes, is rather plain, common, and strangely lacking of style and personality compared to its equivalent in various European cities, where squares and alleys have breathed the soul of the place through history. It could have something to do with the boom of the Japanese economy last century, during which builders might have favored exponential expansion over making streets look pretty. But knowing the meticulous perfectionism of the Japanese, this explanation is unsatisfactory. So perhaps it was in fact entirely purposeful. Perhaps streets were meant to be swamped with electric wires, and residential areas were meant to be all square and piled up, and arcades were meant to look identical in all cities, because they would be nothing more than a canvas, a working basis on top of which to install the organic frenzy of shops and restaurants and shrines and entertainment palaces. In this model, Ginza is merely a very smooth and clean shelf for exposing luxurious brands. It does not have a personality in itself or rather, its personality is not in its own structure or a distinct architecture, but in the aggregation of symbols it hosts. A parallel could be drawn with traditional Japanese rooms: albeit “beautiful” to the Western eye, it is only so through its extreme minimalism, and not through agile complexity or convoluted details. In other words, it is also a neutral canvas to start from and the unique nature of the room is only crystallized by whatever is brought within it: fine paintings, movable furniture, an exquisite meal or the marvelous kimono of a fair wife. Perhaps, then, Japanese urbanism is indeed more about the content than the form, and the true beauty of a Japanese city is not to be looked for in its overall architecture, but in the life and the character of all and everything that inhabit it. Later that day, after a night walk in the aforementioned docks, I have a delicious dinner at Megumi’s place — raw squid! salmon roe! marinated spicy squid (ika no shiokara)! cooked fish and rich miso soup! — and, two bottles of sake later, morning happens again. The second attempt at the eponymous fish market is a success: aquariums filled with squids, fresh fish and moving crabs cover the stalls of the small shops. Merchants shout to attract our attention, or that of crowds of Chinese tourists and old Japanese women coming to get their daily groceries. We pick one of the many donburi shops and I order a kani-uni-ikura-don, i.e. 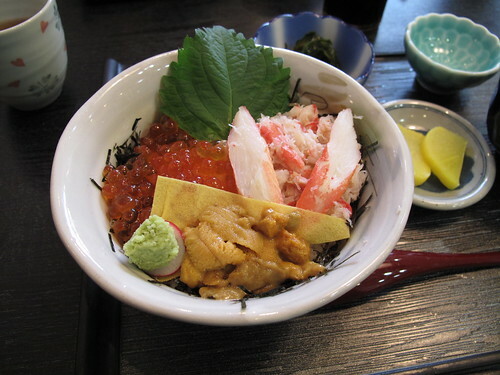 a bowl of rice topped with crab, urchin and salmon roe, along with nori flakes, omelet stripes and a leaf of shiso. 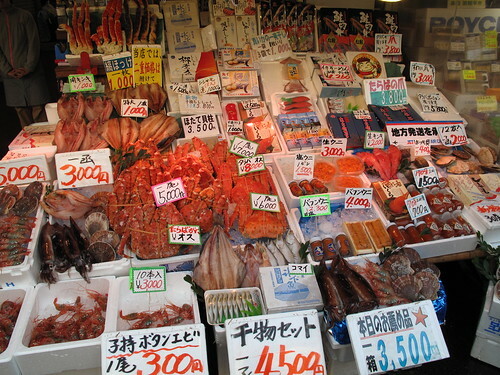 The sea food couldn’t taste any fresher, the urchin sweet and melting, the salmon roe elastic but juicy once pierced.